Several weeks ago The Influence Network did a link up for members to talk about where they are from. I started a post, excited to talk about my wonderful Mississippi, and of course… never finished it to post it! When I realized the link up was closed, I thought about deleting the draft, but decided I still wanted to write about the Hospitality State. William Faulkner once said, “To understand the world, you must first understand a place like Mississippi.” Mississippi, the birthplace of Elvis, blues, and BB King. Home to cotton fields, magnolia trees, porch swings, riverboats, soul food, sweet tea and southern hospitality. People like to make jokes that Mississippians can’t read. Not only can we read, we’re also pretty darn good at writing too. Tennessee Williams, Eudora Welty, and John Grisham are just a few authors that call Mississippi home. The six degrees of separation theory has nothing on us. My whole life, all 30 years, of being a Mississippian, I’ve never met anyone from my state that didn’t know someone else I know. The whole state has a small town, front porch feel. We were named the Hospitality State for a reason. We name our dips and desserts after mud and sin. We make jellies out of mayhaws, persimmons, and muscadines. No finer sweet tea can be found, no magnolias more frequent, no church potlucks more tasty. Mississippi definitely has its flaws, just like every state, maybe admittedly a little more than some others, but it truly is a great place. Often misunderstood, but worthy of being understood. I googled Mississippi facts in hopes of including some extra fun info about my state, and learned things even I didn’t know! We’re pretty cool! The world’s only cactus plantation is located in Edwards with more than 3,000 varieties of cacti. Pine-Sol is manufactured only in Pearl, MS.
Four cities in the world have been sanctioned by the International Theatre/Dance Committee to host the International Ballet Competition: Moscow, Russia; Varna, Bulgaria; Helsinki, Finland; and Jackson, Mississippi. The first football player on a Wheaties box was Walter Payton of Columbia, Mississippi. The birthplace of Elvis in Tupelo includes: a museum, a chapel, and the two-room house in which Elvis was born. On April 25, 1866, women in Columbus decorated the graves of Confederate and Union soldiers in Friendship Cemetery. This gesture became known as Decoration Day, the beginning of what we observe as Memorial Day. Shoes were first sold as pairs in 1884 at Phil Gilbert’s Shoe Parlor in Vicksburg. Inventor James D. Byrd of Clinton holds seven patents and developed the plastic used as a heat shield by NASA. Mississippi University for Women in Columbus was the first state college for women in the country, established in 1884. Belzoni is the Catfish Capital of the World. Approximately 70 percent of the nation’s farm-raised catfish comes from Mississippi. Tell me about your state! What makes it special? What do you love about it? 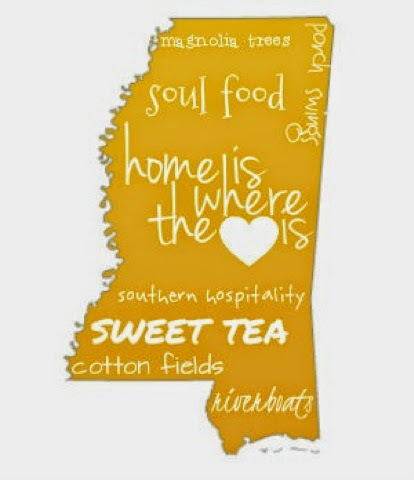 If you are a fellow Mississippian tell me what you love about it too!